The multi-million-pound project, which was first announced last summer, will see landmark buildings lit with colourful spotlights and moving projections. Perth and Kinross Council has now struck a deal with Lancashire-based LITE Ltd to design and install the set-up over the next six years. The local authority has already ring-fenced £5 million towards the £12m project and hopes to make up much of the remaining amount from local businesses, property owners and other funding sources including the Scottish Government. Initially, the plan proved controversial with many locals balking at the hefty price tag. However, the council believes a pilot scheme on High Street and the success of this year’s Norie-Miller Trail has swayed public opinion. LITE was one of 11 companies which put forwards bids as part of the tendering process. 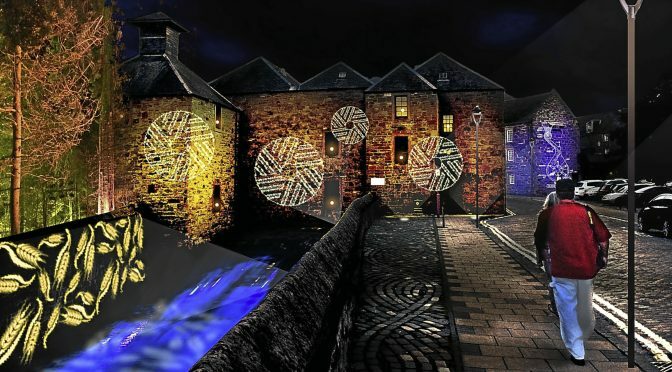 The firm’s David Robertson, who is in charge of architectural lighting projects in Scotland, said: “LITE are delighted to be appointed by Perth and Kinross Council to complete the Perth City of Light project. Recently, the company worked its magic on Dudley town centre, bathing the pedestrianised area in a selection of blue and purple lights. Other notable works include a new weather-proof lighting system at Blackpool’s waterfront – creating a dramatic kaleidoscopic canopy effect outside the famous Tower Ballroom – and a transformation of Dumbarton Bridge. It is hoped the City of Light plan will reinvigorate Perth’s flagging nightlife, boosting local restaurants, clubs and bars. It is also hoped that lighting up pedestrianised precincts, alleyways and buildings will help improve public safety, by reducing crime and vandalism. Draft designs were released last year, showing how the scheme could look. Councillors agreed to spend £100,000 lighting up the local authority’s High Street headquarters, which were turned gold earlier this year to mark Childhood Cancer Awareness Month. Other sites which could be illuminated include Queen’s Bridge, the main city centre precinct and Kinnoull Hill tower. Permanent infrastructure could be installed to host regular lighting events at the riverside. Around 50,000 people visited the Norie-Miller Trail in January, surpassing all expectations. A council spokeswoman said: “One of the key ambitions of the City Plan is to develop the city’s cultural offering and its night time economy in particular. She added: “LITE LTD will supply the provision of architectural lighting design including conceptual art, draft and detailed drawings along with electrical design and development services to assess and prepare costs, and contract documentation.